Headed to the Peter Grubb Hut for a snowshoe trip with friends! We lucked out and had deep, soft snow and clear, blue skies! We’ve had some killer storms this season and we were really praying for a clear trip. In order to reserve a spot in this popular hut during the winter, you need to write them a letter with 3 potential dates and a check in the amount of $20 for each person. We sent our letter request at the beginning of October and the lottery drawing was November 7th. We didn’t get our first choice which ended up being fine by us because conditions were wonderful the weekend we were chosen. There are a few ways to get to the hut from the Castle Peak trailhead. You can take the “service road” to the left which is pretty and super easy to follow due to the tracked out trail but verrrrryyyyy populated. ORRRR….you can take the meadow to the right at the start of the hike and then take the “follow Clark haphazardly through the thigh deep powder woods” trail until you catch up with the PCT. We took the latter and had a freaking epic workout and adventure. 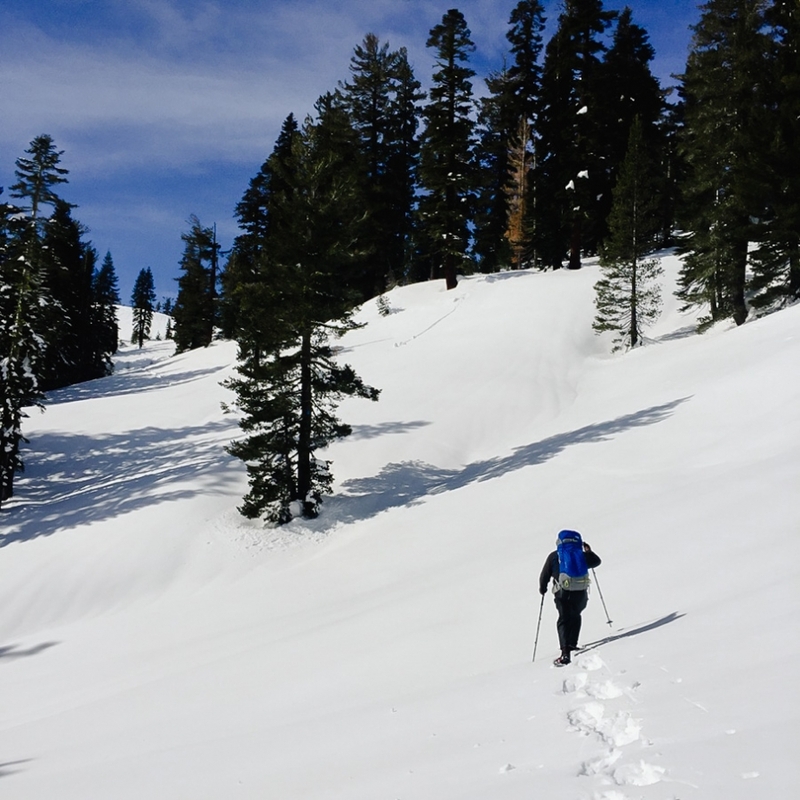 Making fresh tracks on the PCT is not something that comes along every day. We did take the service road out the next day in order to make it down the hill in time for Superbowl! The hut is simply fantastic and worth a trip in any season! Though we didn’t bring our boards like many do to tap that pristine backcountry fluff, we still had an epic time shoeing around and playing cards next to the fire. There are buckets in the hut to collect and melt snow for cooking and drinking but you will need a water purifier before drinking. The hut is STOCKED with wood by the generous efforts of the Sierra Club volunteers so you will stay warm in even the chilliest conditions. We brought our own stove though rumor has it that the hut has one there. No one was going to stand between me and my chili. Or stand behind me after. The hut sleeps 15 so unless you reserve the entire thing, you will be rooming with new friends. Some of who decide to blow up their air mattress AFTER everyone has gone to bed and others who close the chimney flu while a fire is still burning and smoke out the entire upstairs. Please for the love of all that is frozen water, do not be those people. Reservation info HERE and a map and more info of the trail HERE. There are a number of huts maintained by the Sierra Club found HERE. We hope to venture to them all at some point this year and next and participate in the volunteer days to help haul materials in and out. Must give back and pay forward when possible! 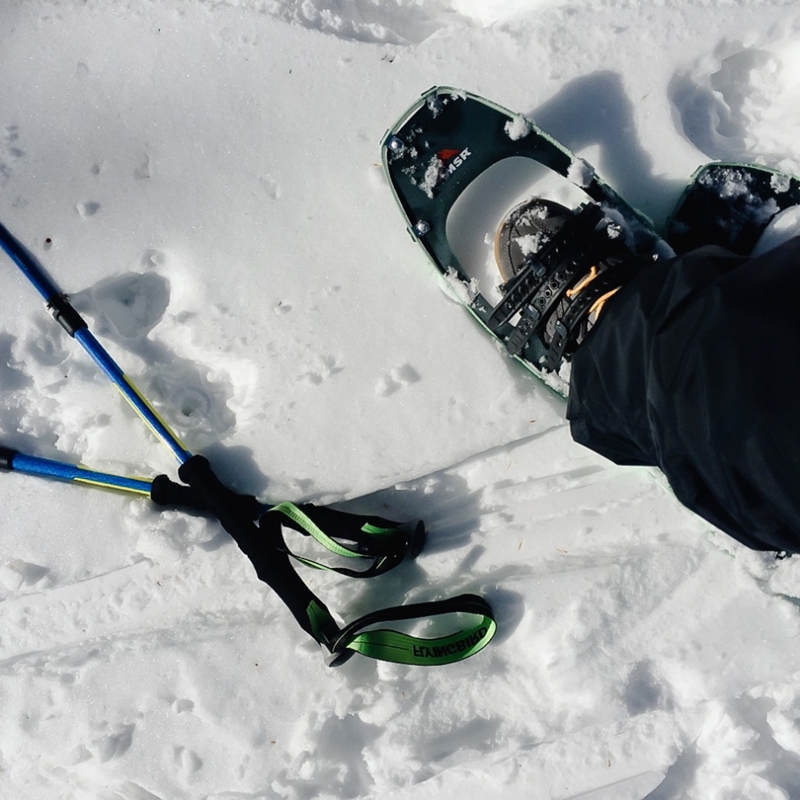 I am absolutely with my MSR Lightning Ascent snowshoes and even more in love with my Vasque Pow Pow boots. I mean come on…they are called POW POW for goodness sakes…how can you go wrong? My poles however are cheap and lame and they will be replaced soon. 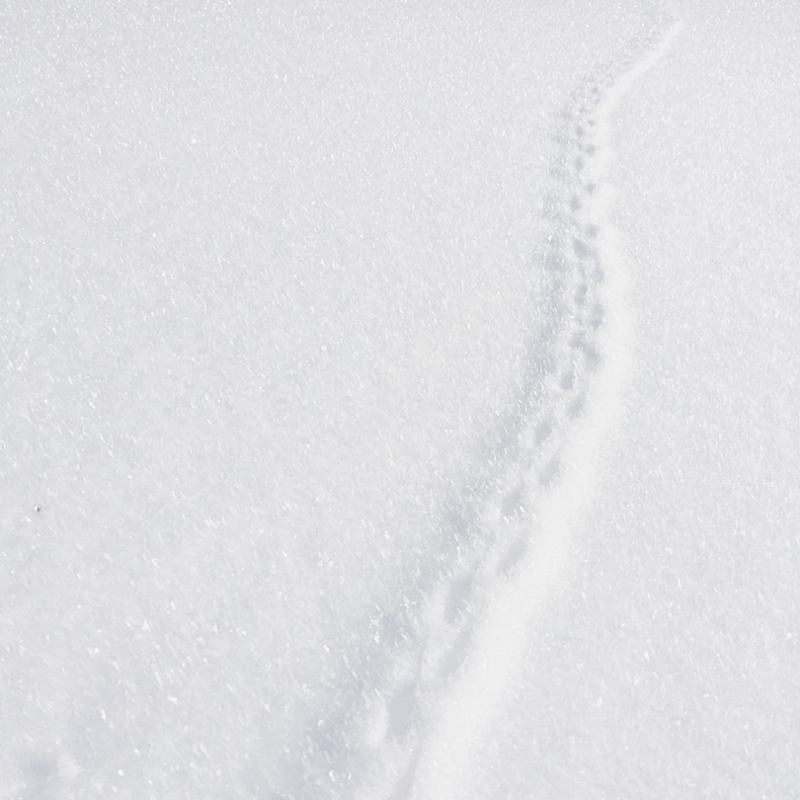 We are still debating what kind of critter made these tracks. The meadow at the beginning of the trail. Making fresh tracks on the PCT! I am printing this one BIG. My heart. He loves to be the rabbit. Our BFFs and adventure travel buddies! The hut was snowpacked to the 2nd floor. Another beautiful meadow straight out from the hut. Is this not the most quaint entrance you’ve ever seen? In order to give an idea of how much snow covers the lodge in winter…below is the lodge in warmer months. Notice the ladder leading to the 2nd floor. THE most beautiful post sunset glow. Sleeping arrangements for the night! US! Have to include at least one dorky group selfie.